A World War Two hero has been buried more than seven decades after his Spitfire was shot down in Italy. 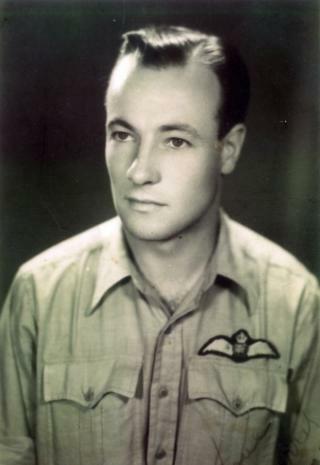 Warrant Officer John Henry Coates, 24, of 111 Squadron was declared missing in action in 1945 after a raid on barges on a canal near Venice. In 2017, his body and aircraft were found by an Italian organisation specialising in recovering WW2 planes. He received a funeral with full military honours at Padua War Cemetery, close to where his Spitfire crashed. More than a dozen members of his family attended the service on Wednesday, although none were alive at the time of his death. His plane was hit by anti-aircraft fire on 5 March, 1945 and crashed close to the village of Cavarzere. But it was not until two years ago that enthusiasts from Romagna Air Finders found the wreck of the aircraft as well as an RAF pilot's wings and the rank insignia of a warrant officer. DNA from human remains found at the site was matched to relatives back in the UK. The work was carried out by the Ministry of Defence's Joint Casualty and Compassionate Centre (JCCC), which traces and identifies British servicemen from both world wars and other conflicts. WO Coates' niece Helen Watts, said the family was delighted that he had been given a hero's burial. She said: "It is absolutely amazing that he has been found all these years later. "This is the kind of thing that only ever happens to someone else."